Our house has a lot of comic books–well actually, not as many as you would think since a lot of Andrew’s reading is done from digital copies. But we have a pretty full bookshelf of actual paper copies and as that is my preferred medium, I tend to peruse the titles there. Andrew is such a fan of the tried and true comics–a lot of Batman and Superman and a crap ton of Marvel (no secret there). As I’ve mentioned before, sometimes the back story and long history of these characters is hard to follow for someone new to the field so I like to go for the odd balls. Many years ago I gifted Andrew one of the Mouse Guard books, honestly I can’t remember if I got him the Fall 1152 compilation or the Winter 1152 book but regardless they’ve both been on that shelf for a while. Andrew read them back then and liked them, I always thought of all the comic books he had on his wish list they looked the coolest. Maybe it was the weird 8 x 8 in. book format, but more likely it was the super cool art and almost nostalgic nature of the illustrations. The whole thing reminds me of one of my favorite childhood cartoon series, The World of David the Gnome broadcast on Nickelodeon back in the late 80s and early 90s. There is just something magical about a cast of small creatures, living a hidden life in the forest making homes in trees and under rocks. Then you start getting into David Peterson’s story–of the Mouse Guard whose duty it is to protect the open lands between mouse cities. 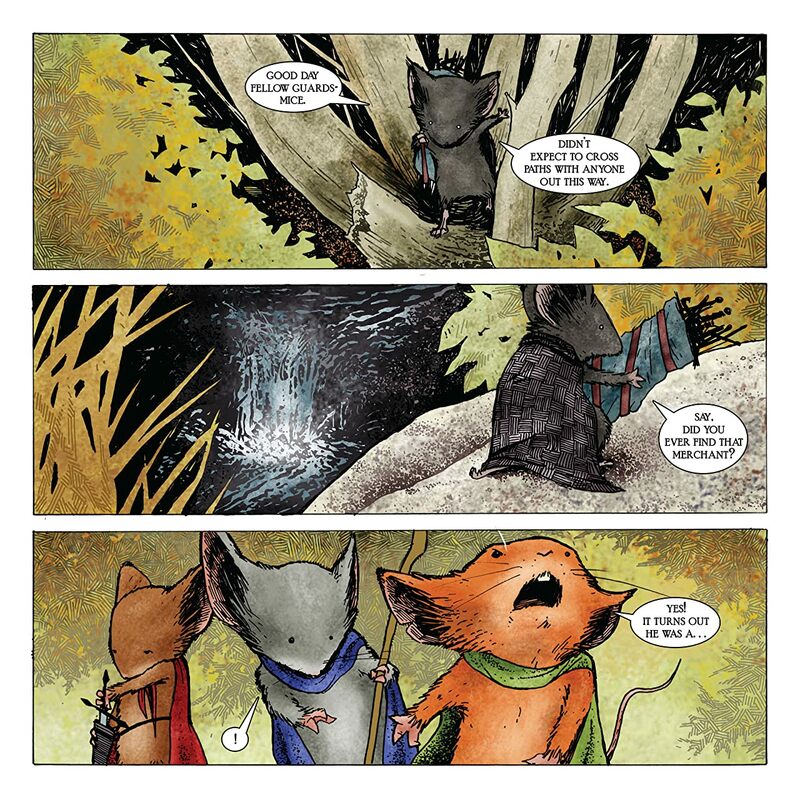 The first issue throws you right in with a trio of Mouse Guard–Lieam, Kenzie and Saxon who are tasked with searching for a lost grain peddler on one of the paths between cities. 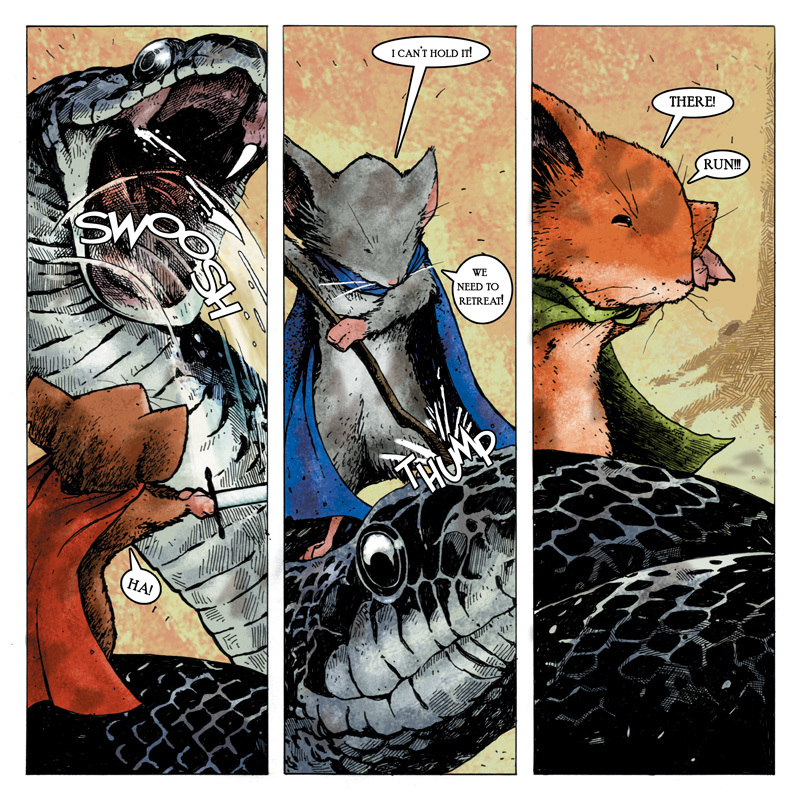 Upon finding him, unfortunately in the gut of a troublesome snake, they discover he was part of a treasonous plot to invade the city of Lockhaven, essentially the capital city where the Mouse Guard is headquartered. What ensues is the classic tail (haha, get it?) 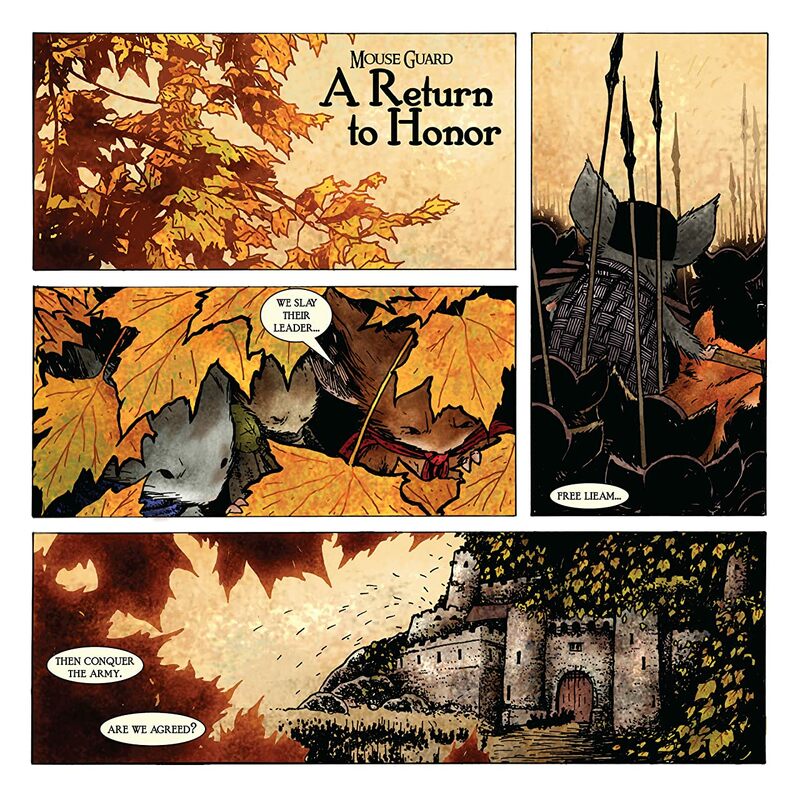 of the loyal Mouse Guard racing to ward off the army of dissenters and in the process engaging a true legend of the land, The Black Axe, to help them. There are battles against giant crabs, capture and escape, drawbridges and a swarm of bees. What more could one want? This quick read was so fun and creative and I certainly didn’t mind as Jakob was reading over my shoulder. While I think a lot of modern comic books have either been pegged as a kid’s book or an adult comic, this is one that really can span all age ranges. The story is so classic, but told in such an inventive way to keep adults engaged and without blatant violence on the panels that would make it inappropriate for kids. Again, a classic story of good versus evil, a la The Three Musketeers or Robinhood. There is not a lot of suspense as you can probably surmise what will happen in the coming pages but the beauty of the book can make you forgive this short-coming. The mice in this book are so loveable. I was somewhat surprised to see how much emotion the illustrations conveyed–the determination, the grit and the loyalty these mice had for their guild. I love how Peterson transforms the typically despised race of mice and brings them to life as heroes in their own little world. Maybe I’m crazy but it makes me wonder what the world is really like from their perspective. Said it before and I’ll say it again. This book is beautiful. Its cartoonish yet real. It’s childlike yet mature. The art is what really brings this fantasy world to life. I try not to dole out too many A+ grades but this one really hit the nail on the head for me. It was purely beautiful and I can’t wait to read the Winter series and to share these with both of our kids. Well deserving of a spot on our family bookshelf! GotS Name the Ghost Contest! This was always one of my favorites. Lots of great sequels!